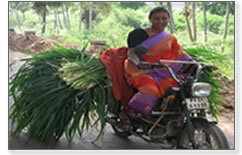 (Planning Commission, 2007, Report of the Sub-Group on Gender and Agriculture). What is in this resource CD? This resource CD is about promoting a new consultative process for designing gender-sensitive demand-led programmes for rural women. In this approach, programmes are designed through an analysis of household level information about women’s livelihoods, their aspirations and opportunities for sustainable income generation. This information is collected and shared through a database, which facilitates the identification of relevant programmes. Right customers are selected for each programme thus ensuring that the final programme design is relevant to the needs and requirements of women farmers. Why this approach is important? While several programmes support rural women by way of training and credit, there is a mismatch between the kind of support that is provided and the demands of the rural communities. Existing approaches have several such limitations and there is a demand from donors and national governments for a better design process that is pilot tested for wider promotion. Will this approach address all gender issues? No. Addressing gender issues in totality would necessitate interventions that go beyond providing better employment and income generation opportunities for women. The interventions include, organizational, institutional and policy reforms at various levels. At the same time, there is a need to respond quickly to the demand from rural women for productive employment and more income. This approach primarily addresses this immediate demand while recognizing other kinds of support required. However, there is a scope to conduct a full gender analysis during the programme design stage. Is this the best design process ever developed? We are not claiming that. However, we believe that this design process addresses some of the major limitations in the existing approaches. The description of the methods with live examples from the field would assist those who are keen to experiment with better approaches. We are also keen to know that. Finding better ways of designing and implementing demand-led programmes that improve livelihoods of rural women is a journey which we, like many of you, have started not long ago. Considering the road travelled so far, we believe strongly that this journey is going to be much longer and painful than what we all have ever expected. Every journey is a learning experience and we thought that it would be good to share our experience with many of you who might have undertaken similar journeys from different locations. We appreciate receiving your feedback. The unique three-stage approach allows for designing programmes that are based on an analysis of baseline information, feasibility studies and a series of consultations with a range of stakeholders to achieve convergence. The same database could be used and adapted by multiple agencies for designing programmes. Data on customers and coverage of each intervention will facilitate careful selection of customers and complementary programme interventions by others. This approach relies on a process of consultations and dialogue with a range of stakeholders. Working in partnerships towards an agreed end point helps to achieve convergence and prevents the duplication of efforts by individual organisations towards the same goal. All relevant information on the location, livelihoods, aspirations, opportunities for better employment and income and support-service networks are collected to create a database that could be updated and shared widely. Uses MS-Access platform and new fields/modules could be added all the time depending on the evolving situation. Speedy access to real time data on progress at customer end allows senior management to track progress. One time investment for creation of database in the beginning saves a lot of time and resources of the programme. The same database could be used for monitoring progress and all types of evaluation. Every visit of programme officials to customers could be also used to update the database.